Hall, Manly Palmer. Masonic Orders of Fraternity. Los Angeles: Philosophical Research Society, 1950. Russell, Jeffrey B. A History of Witchcraft. London: Thames and Hudson, 1980. Tuchman, Barbara. A Distant Mirror: The Calamitous 14th Century. New York: Ballantine Books, 1978.
prevents pregnancy in a woman, and the untying of them facilitates conception and childbirth. In mainstream religious practices, knotted fringe is believed to confuse and entangle evil spirits, one reason why priests wear collars with no ties, for evil spirits caught in tie knots would disrupt religious services. Legend has it that the prophet Muhammad was bewitched by an evil man and his daughters, who tied 11 knots in a cord which they hid in a well. The spell made Muhammad ill, and he wasted away nearly to the point of death. To save him, God intervened and sent the archangel Gabriel to reveal where the cord was hidden and how to break the spell. When the cord was brought to him, Muhammad recited 11 verses from the Koran. As he spoke each line, a knot loosened itself. When all the knots were undone, the spell was broken. In Sura CXIII in the Koran, Muhammad calls magicians' work "the evil of [women who] are blowers on knots." Witches and sorcerers (see sorcery) were believed to be able to control wind with three knots tied into a rope, or sometimes a handkerchief. When the three knots were tied in the proper magical way, the wind was bound up in them. 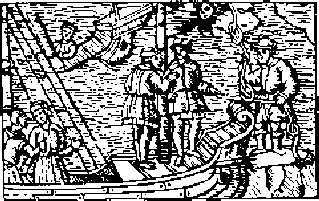 Sorcerers and witches sometimes sold their magic knots to sailors. The release of one knot brought a gentle, southwesterly wind, two knots a strong north wind and three knots a tempest. In the folklore of the Shetland Islands and Scandinavia, some fishermen are said to command the wind this way. The belief in controlling wind by tying it up goes back to the legends of ancient Greece. Odysseus received a bag of winds from Aeolus to help him on his journey. In West African witchcraft, the tying of a knot while saying a person's name gives the tier of the knot power over the person named. The power is retained as long as the knot remains tied. In the west of Ireland, an old method for healing sick cattle called for a worm-knot, a piece of twine tied in certain knots and dragged over the animal's back. If the twine went smoothly, the cow would recover; if it caught and hitched, the animal would die. In MAGIC, knots are used to bind and loosen deities and power; as tools in psychic attack and defense; and in magical snares. Magic knots also have the power to kill. According to a medieval formula, a witch's LADDER, made of a string with nine knots, when hidden, causes a victim to die a slow death. Many contemporary Witches use knots in cord magic. In one method, the Witch ties nine knots while chanting and/or visualizing her objective. By the ninth knot, the spell is complete and the magic power is stored within the knots. According to some formulas, the spell is then effected by the untying of the knots, usually one at a time over a period of nine days; according to others, the cord is tied into a circle. 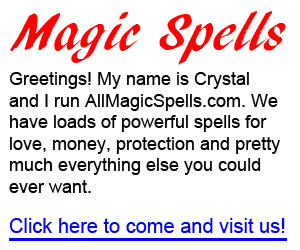 Cord magic is also done by a coven as a group. Slip knots are worked in cords, and the magical power is released when the knots are loosened.